The 41st president of the United States on freedom, service, purpose and more. George Herbert Walker Bush, the 41st President, has died at the age of 94. Bush was the only person ever to have served as vice president of the United States for eight years (1981 to 1989), followed by a four-year term as president (1989 to 1993). Born on June 12, 1924, in Milton, Mass., Bush served as a U.S. Navy pilot during WWII, completing 58 combat missions, including one in which his plane was shot down. He was rescued by a submarine near the Japanese Island of Chichijima. When he returned from the war, he attended Yale University and met his wife, the late First Lady Barbara Pierce Bush, to whom he was married for 73 years until her death in April 2018. Barbara and George Sr. had six children, among them, of course, the 43rd president of the United States, George W. Bush, as well as former Florida governor Jeb Bush. Bush’s father, Prescott, was a U.S. Senator, and he followed in those footsteps, first serving as a Texas Representative to Congress, followed by United Nations Ambassador, Republican National Committee Chairman and C.I.A. director. From there, Bush ran for president in 1980, losing the Republican nomination to Ronald Reagan but becoming his running mate and ultimately VP. Highlights of Bush’s four-year presidency include the dissolution of the Soviet Union and the fall of the Berlin Wall, the passing of the Americans with Disabilities Act and the Clean Air Act and Desert Storm. 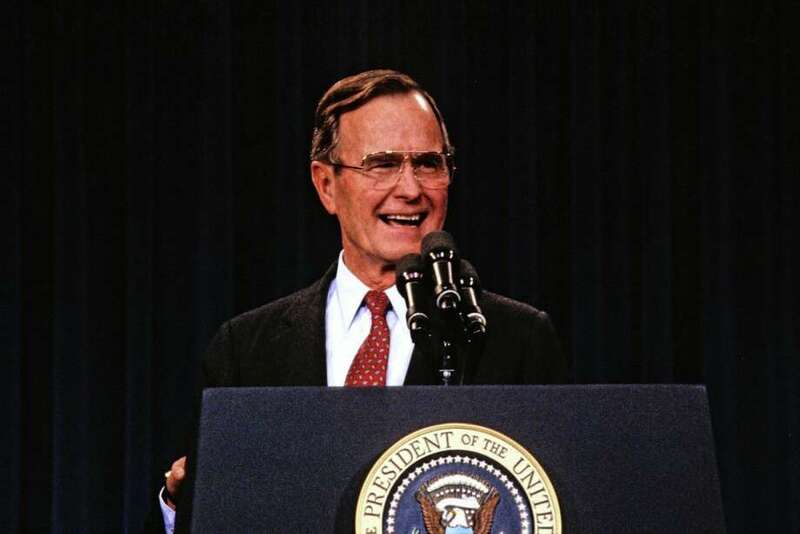 Many of Bush’s public addresses during his presidency touched on themes of freedom and the triumph of democracy at the end of the 20th century. Bush himself admitted many Americans perceived him as out of touch with regard to their daily struggles, and voters did not reelect him in 1992. After his time in office, Bush remained active in public service. He also faced public scrutiny recently -- several women came forward with claims that the former president improperly touched them. Bush's spokesman released a statement saying that "on occasion, [Bush] has patted women's rears in what he intended to be a good-natured manner" and apologized to "anyone he has offended." Read on for 12 memorable quotes from Bush 41.